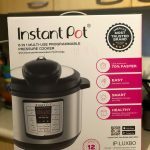 I’ve recently jumped on to the Instant Pot bandwagon and my life has never been the same! Instant Pots are basically crockpots on steroids, at least that’s how I’d describe them. The can do just about everything a crockpot can do only they do it faster! 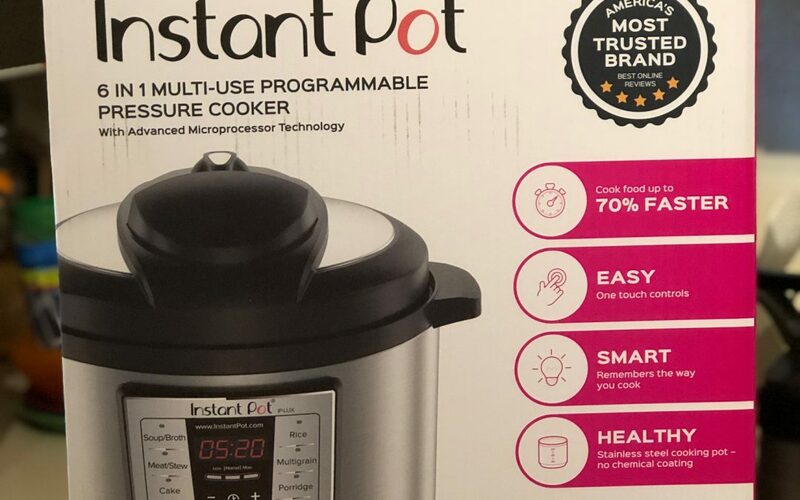 Because Instant Pot uses pressure to cook food instead of constant slow heat like a crockpot meals can be made not only faster but better tasting because they get tender but don’t get mushy like veggies do when cooked in a crockpot. That’s why making this Instant Pot Shredded Beef is the perfect way to make fillings for tacos, chimichangas, burritos, and more. 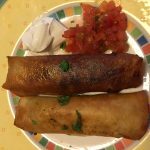 Today I’m going to share with you my recipe for Instant Pot Shredded Beef Flautas. Actually it’s basic shredded beef with Mexican spices which I’m using to fill flour tortillas which I then deep fry. 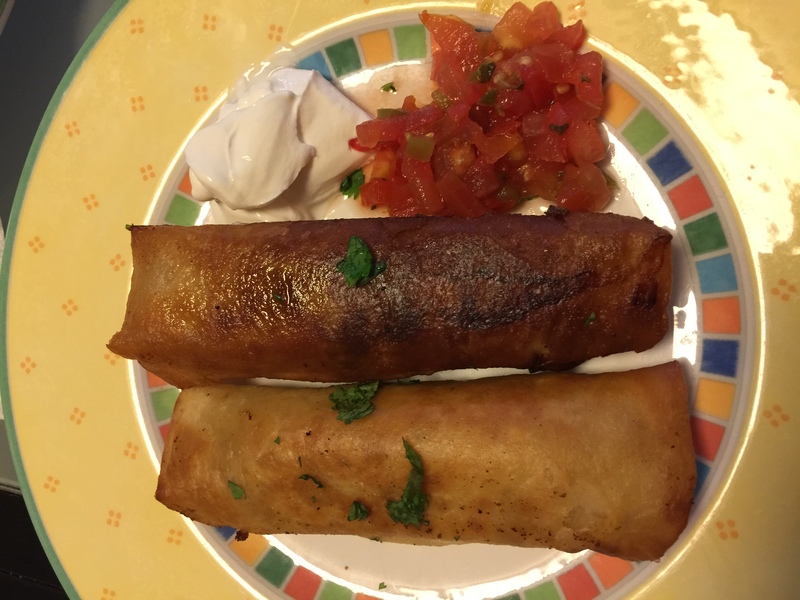 That’s what a Flauta is a rolled and fried four tortilla, some folks call them taquitos, but what ever you call them they’re yummy just the same. You can use this Instant Pot Shredded Beef to fill just about anything you need to fill with shredded beef; like burritos, chimichangas, enchaladas, empanadas, and more. 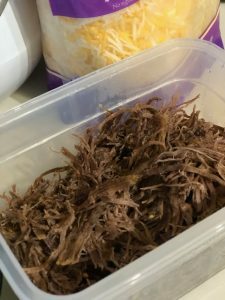 I’ve always used skirt or flank steaks to make shredded beef, they turn out pretty tender making them pretty easy to shred. But once I started making this Instant Pot Shredded Beef the shredding is even easier, the meat literally just falls apart! I’m sure you’ll love this recipe so make plenty. I usually freeze extras so that I can use them later for burritos, chimichangas or whatever. If you’re going to freeze it be sure you use freeze safe containers and label them. Because it’s shredded the beef will last in the freezer for about a month so be sure you use it soon! Summer’s in full swing! This means our backyard grills our working overtime turning out delicious barbecued food. And those of us who prep for the barbecues are looking for different foods our partners or husbands can toss on the grill. Well just in time for your July 4th. barbecue are my Sweet Lime Cilantro Chicken Skewers. They are delicious! 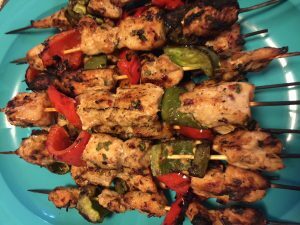 My Sweet Lime Cilantro Chicken Skewers are easy to make and best of all can be served as a meal of chicken kabobs, top fresh salads for a light lunch, or rolled in a tortilla for an delicious snack! These Sweet Lime Cilantro Chicken Skewers are perfect for your next backyard barbecue. They’re a little bit sweet, a bit cirtursy, and a whole lot spicy! 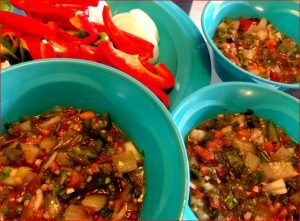 Serve it with a side of my Spicy Homemade Salsa for a delicious Mexican Fiesta! 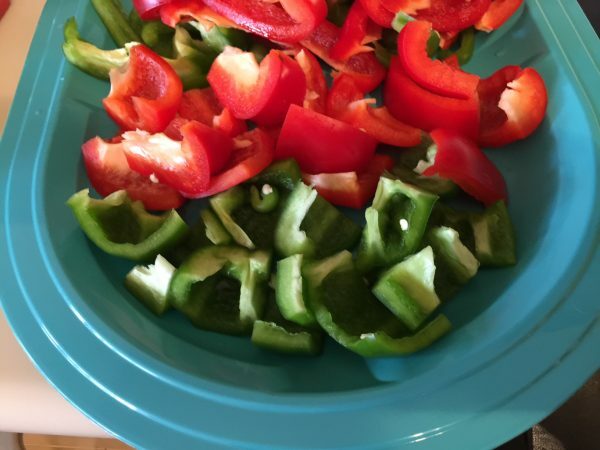 If you’re not a fan of hot spicy food, no worries, just omit the peppers for a milder version. Place in the fridge until ready to cook. Leave in fridge atleast 2 hours but no more than 24 hours. Place any remaining marinade in a bowl to use for basting chicken while it cooks. I concluded years ago that if you want great salsa you only have two choices. One, find a family owned Mexican restaurant preferably one south of the border or in border zones in states like Arizona, California, and Texas. Or two, make it at home. Since I live in Hawaii I generally opt for option two as I can’t jet off to Mexico or the border states each time I’ve a yen for salsa. 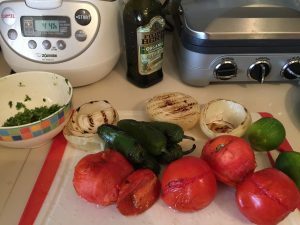 So I came up with my Spicy Homemade Salsa Recipe. At our house we like our salsa chunky, tasty, and very spicy. That’s why those store bought bottles of salsa just don’t make the cut. I mean the old TV commercial was right who wants to eat salsa mass produced in like Ohio or worse yet China! My Spicy Homemade Salsa is perfect. It uses fresh ingredients and lots of it. It’s chunky and flavored with lots of fresh cilantro, limes, and of course hot peppers. The hotter the better! Now my Spicy Homemade Salsa is just that salsa, meaning it’s saucy. 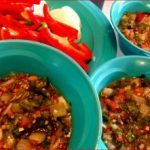 We use my Spicy Homemade Salsa as a dip, topping, or filling. Yes a filling! I love it rolled up in a fresh hot tortilla! 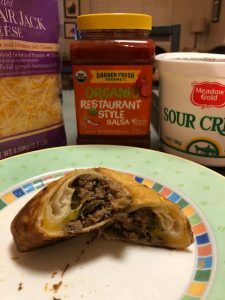 Try this salsa on Dion’s Steak Flautas, it makes that delicious dish my grandson Dion makes for us outstanding! If you haven’t guessed by now I love Mexican Food! I can eat it everyday! One of my favorite Mexican dishes are chicken tacos. I love them wrapped in fresh warm flour tortillas. The chicken filling is real easy to make, if you’re pinched for time you can even use taco seasoning packets to give it that Mexican flavor. But I like to make it from scratch and sometimes I experiment a bit with the ingredients. 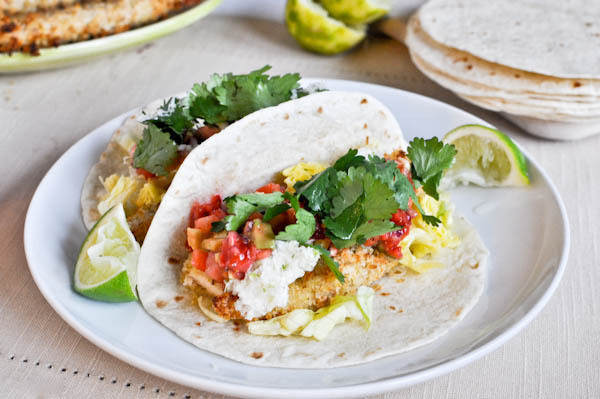 Recently I came up with these Margarita Chicken Tacos, they are delicious! 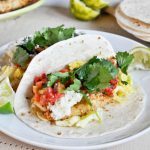 What makes these Margarita Chicken Tacos different is that the chicken is marinated in, you guessed it, tequila and lime juice; hence the name Margarita Chicken Tacos! They really are easy to make and are too yummy! I marinate the chicken about an hour before I sauté it. I serve it fresh wrapped in warm flour tortillas and topped with chopped cilantro, cheese, sour cream, and salsa. It’s a complete meal in a tortilla. Here’s the recipe. I hope you’ll love it as much as we do. Combine all the dry seasoning together in a mixing bowl. Add Olive Oil, Vinegar, Tequila, onion, and 1/2 of the chopped cilantro. Squeeze the juice of the lime over mixture. Sauté in large frying pan about 10 minutes or until chicken is fully cooked. Serve with warm tortillas and garnishes. You can sprinkle each taco with the remaining cilantro. I love Chimichangas! It’s my favorite Mexican food. I order it every time we dine at a Mexican restaurant and I even make it at home. I love it filled with ground beef, shredded beef, or shredded chicken. What you may ask is a chimichanga? It’s a deep friend burrito! I’m not a burrito fan but fry it up and I can eat it everyday! I was never much on Mexican food until I discovered the Chimichanga. I still remember the first time I had this deep fried burrito. It was at the Mexican restaurant chain called Chi-Chi’s. The chain is long gone from the United States, but my love for the chimichanga remains. I’m not really sure if the Chimichanga is truly a Mexican dish. It is popular in the Mexican states of Sinaloa and Sonora, but it’s definitely a Tex-Mex staple. It’s on the menu of every Mexican restaurant I’ve been to in Houston and many others from coast to coast. But not all chimichangas are equal. I’ve had some really bad ones, usually those that are smothered in some kind of sauce, not good! I’m a simple eater, I like my chimichangas straight up! I don’t like it covered in sauce! I like my chimichangas deep fried and served with a sprinkling of shredded cheese with a side of sour cream, guacamole, and hot salsa! Finding a great chimichanga, or great Mexican food for that matter, in Hawaii is a challenge. There are a couple I can live with, but nothing special if you know what I mean. That’s why when I crave this crunchy burrito I usually make it myself. It’s pretty easy! Here’s my Ground Beef Chimichanga recipe, hope you love it as much as we do! 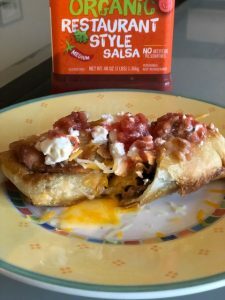 I usually serve chimichangas with Spanish rice and refried beans for a filling meal!